Valley Heights coach Tony Trimble believes his Mustangs and Jackson Heights have multiple commonalities, including “old-school, smashmouth” principles. Valley Heights is run-heavy behind its triple option attack with veteran offensive coordinator Lew Whitson, who developed the look during his time at Onaga. Jackson Heights coach Caleb Wick, a former Smith Center player under legendary coach Roger Barta, incorporates the wishbone scheme the Redmen have ran for decades. Each squad averages at least 341 rushing yards a contest. Both have multiple running backs with big numbers and start a young quarterback: Valley Heights freshman Cameron Beardsley and Jackson Heights sophomore Cooper Williams. Jackson Heights has outscored teams 246-20 and stands fourth in scoring offense and first in scoring defense in 2-1A. Valley Heights has a collective margin of 286-132 with the second-ranked offense. Jackson Heights has the second-softest strength of schedule in the class, better than only Valley Heights, according to Prep Power Index. This Friday, Jackson Heights (6-0, 2-0) plays host to fifth-ranked Valley Heights (6-0, 1-0) in a critical Class 2-1A, District 2 contest. It marks the first of several key matchups in a district that includes traditional power Centralia (4-2). This marks the sixth straight season the teams have matched up. Jackson Heights holds a 3-2 margin. Valley Heights won 26-22 in district play last year, a victory that propelled the Mustangs to the district runner-up spot behind Washington County. Valley Heights sophomore Cole Coggins has delivered a surprising season with 989 rushing yards and 15 scores. Senior Jordan Yungeberg had 913 yards in 2016. This year, he has tallied 745 yards and 16 scores. In Week 3, Valley Heights won 46-13 versus Christ Prep. In its other five contests, Christ Prep has permitted just 59 points, including a 12-6 loss last week to Jefferson County North, a top-five 2-1A team. Trimble, in his 13th year with Valley Heights, credited his veteran offensive line. Senior tight end Harrison Blaske and senior center Dalton Joseph were first-team all-league picks in 2016. Both have played well this fall. Junior guard Allen Tryon and tackle Brady Trimble, each returning starters, created a formidable right side of the line. Wick labeled the Mustangs an “offensive juggernaut.” Brady Trimble, the team’s leading tackler, and Blaske have led the defense at linebacker. Valley Heights has lost three starters for the year, including senior Bryan Yungeberg. “Fortunately, we feel like for us, our offensive line is still intact and that always gives us a chance to be successful,” Trimble said. Yungeberg played slot back in 2016 and was expected to start at quarterback this fall. He broke his thumb two days before the first game and returned to slot back. His thumb healed, and Valley Heights considered switching him back to quarterback. Then, he dislocated his shoulder in practice, needed surgery and is done for the year. While Valley Heights has captured each win by at least 30 points, Jackson Heights has one close victory. 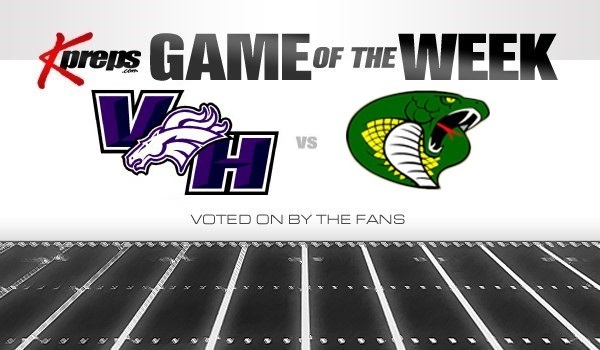 The Cobras earned a key 16-14 conference win versus Maur Hill-Mount Academy in Week 4. Maur Hill took the lead in the fourth quarter. Jackson Heights, which starts two freshmen and a sophomore on the offensive line due to injuries, responded with a touchdown and two-point conversion from senior Brady Holliday and held the Junior Ravens scoreless the last half of the quarter. In its double tight-end, predominantly pistol look, Jackson Heights has junior Lane Thomas at left end, freshman left tackle Taylor Wamego, senior left guard Tyler Wendroff, freshman center Colby Doyle, senior right guard Garrett Kilpatrick, sophomore right tackle Carson Williams and senior right end Braden Dohl. Kilpatrick took over for sophomore Riley Watkins, a returning starter and the team’s best lineman early. Watkins has been out with a nerve problem in his back since Week 2. Williams has emerged as the offensive line’s leader. Holliday has led the Cobras with 100 carries for 856 yards. Senior Sebastian Butto has 58 carries for 492 yards. Butto played sparingly the first two contests and delivered 21 carries for a team-best 129 yards in the Maur Hill win. The Cobra defense is predominantly based on Smith Center’s longtime 4-3 look that the Redmen have with veteran defensive coordinator Brock Hutchinson. Jackson Heights uses more of a 4-4 because of their linebacking strength. After he didn’t see any varsity time as a sophomore, junior Conlan Bruggeman has emerged as a big surprise at middle linebacker. He ranks second in tackles behind Holliday, a returning starter at linebacker. Wick called Bruggeman the team’s hardest hitter and emotional leader. Junior Austin Mock, a previous backup, has stepped up on the defensive line. After forcing five turnovers in a Week 1 win versus Maranatha Academy, Jackson Heights has just six in the last five contests. None of the first-month opponents had more than 201 yards in a game, and the Cobras have shut out its last two opponents. Since the start of the ’15 season, Jackson Heights leads all current 2-1A squads in scoring defense at 11.5 points allowed a game, better than powers Smith Center (12.1), Meade (14.0), Colgan (14.1) and Olpe (15.5), among others.